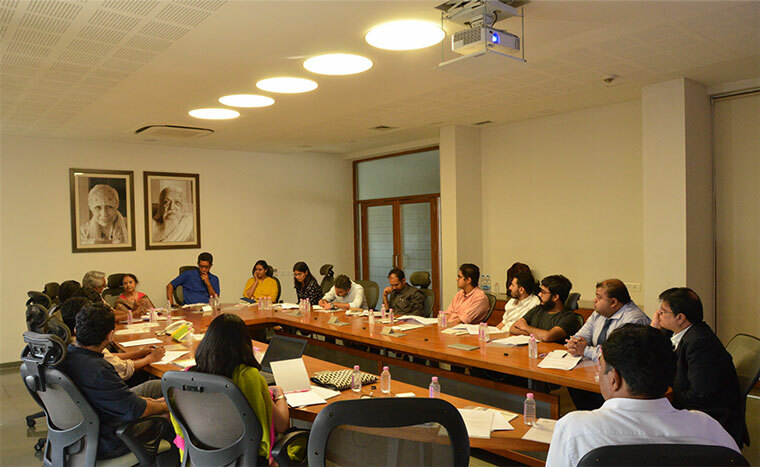 The team at Auro Design School comprises some of the best minds in the Indian Design space. This allows us to promote our principles of broad inquiry to a greater degree. The team will work with you to develop a well-defined perspective of what the Design space is like, where you stand in that space, and how to carve out a niche for yourself. More specifically, the team at Auro Design School is very diverse, and will be able to provide you a very effective interdisciplinary environment while teaching you the importance of making the environment and the larger ecosystems where your designs reside, some of your most importance considerations. He enjoys sculpting figurines, especially miniatures, and has also conducted several workshops for design students at various institutes across India. He has won a number of national level design, landscape and sculpture competitions. Presently he runs a practice which provides consultancy in architecture, interior design and urban design while collaborating with institutes for creating sculptures and other artworks. He is associated with INTACH-Surat chapter, working on the local built heritage. His areas of interest include history of architecture and cultures, urbanism, semantics and semiotics of spaces, sculpture and concept art. As an architect-urban designer and a sculptor, he sees his role as a responsible citizen first, helping to secure a path to a sustainable growth in the future. He looks forward to creating a fine balance between academics and practice as a design professional. Ajit Rao started his professional journey as a cartoonist and then, after graduating in architecture from the Bombay University, as an apprentice to the renowned architect B.V.Doshi, in Ahmedabad. After studying animation at Sheridan College, Canada, he worked briefly on animation films with India’s leading animator Ram Mohan in Mumbai. His foray into teaching started when an invitation by renowned designer Rajeev Sethi to conduct a workshop with folk artists in Orissa, gave him a fascinating insight into the wealth of Indian arts and crafts. An intuitive desire to teach led him to share these varied accumulated knowledge and experiences with students and amateurs alike, through workshops and interactive lectures. Over the years, he has headed various animation-training programs at leading animation studios and has also been a visiting faculty at premier design and architecture institutes in India. Over the years, Ajit Rao has donned many professional hats, as an architect, an artist, a designer, a caricaturist, a cartoon film maker and a teacher. Ajit has now set up a studio in Lonavala named SAMASKAARA which is bringing these diverse resources to the service of various aspects of Indian cultural expressions. Avinash received a Bachelor’s degree in Interior Design from CEPT University after which he worked in various architecture firms in Surat and Goa. Concerns for Sustainably built environments and appropriate construction technologies led him to participating in workshops conducted at Auroville, Bengaluru, Nagpur and Hyderabad. Growing interests in natural resource management, conservation, and restoration, along with a strong inclination towards understanding ecology and ecosystems drove him to pursue a Master’s Degree in Landscape Architecture. For the past eight years, he has been teaching at various Design and Architecture colleges. He emphasizes Hands-on working with materials and deeper exploration into processes and techniques. This is linked to the idea of efficient and ethical design which lies at the core of both environmentally conscious and environment-responsive design. Devina Kothari creates ‘data driven designs that drive social change’ by bringing current day technological advancement to the doorstep of rural India. Devina is an innovator, industrial designer & strategist, TEDx speaker, and the founder of Zuan Design Labs. She believes in ‘design for a cause’, and making good designs, both affordable and easily accessible to rural India. Recognizing that no design journey is without hurdles, she believes in marching ahead while adhering to the commandment “do not quit until you achieve what you believe in”. While the world is drifting towards disruption, she is moving towards generating aggregates and clusters that address the unmet needs of users. She has inspired the youth with her ideas through TEDxBangalore, TEDxEMWS and TEDxIITKharagpur. She has also been conferred with the Red Dot Award in 2014 for her design, The closed loop insulin delivery system. Some of her other awards and achievements include the Power of Asian Design 2016, Daughter of Gujarat 2016, Swayam Siddha Award 2015, Women’s excellence award 2015, I-Design Award, Ignite Diabetes Challenge 2013, etc. Jagrut Raval is an artist whose interdisciplinary practice spans diverse mediums manifesting primarily through installations, photography and videography. He graduated with a Master of Fine Arts in Photography from Savannah College of Art and Design, Savannah, USA, and a Bachelor of Interior Design from CEPT University, Ahmedabad, India. His interest lies in the homogeneity between various media that allows experimentation with imagery and its spatial relationships. His work broadly deals with philosophical concepts of Time, History, and Belonging within both personal and public contexts. His works have been exhibited in the United States, China, Egypt, Romania and Bulgaria. He was the inaugural recipient of the Crystal Ruth Bell Residency Award in Beijing, China. For the past two years, he has been involved with organizations working towards cultural activation in the Himalayan mountains of Ladakh. He has been teaching workshop-based courses in Leh, Kargil, and Sikkim that help people understand and amplify the history and culture of the region. Currently he spends his time between Ahmedabad and Ladakh. Jwalant is the Principal Architect and founder of andblack, a design studio. His work ranges from Furniture design, product design, Interior Design and architecture each influencing the other. After gaining some professional experience at Mozaic Design in Goa, and then Mistry Architects in Bangalore, he went on to pursue masters in Architecture and Urbanism at the AA (Architectural Association), London. Jwalant furthered his professional experience at Zaha Hadid Architects in London for the next 4 years working on various prestigious projects including the Petroleum Research Institute in Saudi Arabia, Dubai Opera House, Soho Beijing. Now, alongside andblack, Jwalant also runs a design studio on ‘Computation Design’ with master’s students from the School of Design in CEPT University, Ahmedabad. Jwalant’s design interest lies in experimenting with material behaviour and systems. His tools are a blend of technology and parametric software, along with Indian craft. He believes that with today’s world being driven by digital technology, blending craft and technology will allow designers to stand out and be relevant. Kamalika Bose is an urban conservationist with ten years of experience in heritage-oriented planning and advocacy, design education and research. She is a Fulbright Scholar (2011-13) and a Society for Architectural Historians-Getty International Fellow (2016), and was formerly Assistant Professor at Faculty of Design, CEPT University, Ahmedabad (2008-15). She also has a Master's in Historic Preservation Planning from Cornell University. Her work focuses on the revitalization of urban heritage in India, through tools of economic incentivization, community participation and an arts-based framework – most recently working on Chinese and Jain heritage in Bengal. Kamalika is currently based in Mumbai where her latest stint was as Project Manager for the seminal exhibition The State of Architecture: Practices and Processes in India. Kamalika has gained international work experience in areas of neighborhood preservation and cultural heritage through positions at Historic Districts Council, New York, and the Cooper Hewitt Smithsonian Design Museum, New York. She has authored three books (including the well-recognized A History of Interior Design in India, Vol 1: Ahmedabad), collaborated on numerous research projects, and presented her work at national and international conferences. The one who brought the whole team together through sheer strength of will. Krishna Shastri has long been known to be someone who believes in helping the outliers of the system. Now the same outliers are supporting her in her newest project. Krishna Shastri was Professor and Dean at the Faculty of Design, and the Coordinator of the Design Innovation and Craft Resource Centre (DICRC) at CEPT University, up until 2016. She was awarded Diploma in Architecture from School of Architecture, CEPT University and Master’s in Architecture & Urban Design from School of Architecture, Washington University, Missouri, USA. Now, she is practicing Interior Design, Urban Design and Architecture as an independent consultant. She is an academician with over forty years of experience in the field, and during her twelve year stay in the USA, she was actively involved in designing curriculum and infrastructure for various community colleges and projects. At CEPT University, she had been instrumental in establishing the School of Interior Design and guiding it ever since its establishment over twenty years ago. Prof.Shastri has also been a visiting professor at School of Interior Design, University of Kentucky, USA (2003), School of Interior Design, University of Cincinnati, USA and Professor at Interior Design Institute of Louisville Technical Institute, USA (1978-81). Now, at Auro Design School, she brings her wealth of experience and wisdom, along with her desire to help outliers, and her belief that design only prospers when it respects the culture where it is created and grows. Kunal Lapsiwala is a graphic designer/design consultant, working for the most part with logo design, branding and marketing. He truly believes that design is the backbone for every product, every brand, and every service! On completing his graduation in communication design at Billy Blue College of Design, Sydney (Australia) in 2009, he returned to India & started working as an associate graphic designer, at Roar Studios, where he matured as a designer. After a few years at the studio he started working as a freelance designer and lead design consultant at Mvix India Ltd. Along with design he has a keen interest in typography. He regards typography as a cardinal driver of design. He often attends type centric events like Type Camp Bharat & Typoday, to enhance his knowledge about typography and its application. With the aim of spreading design awareness and knowledge, Kunal co-founded TAD – Talks About Design. Since 2015, he has been teaching subjects like the basics of graphic design & typography at Surat School of Fine Arts (VNSGU). Mitul is an independent practitioner, even after his work with Studio Mumbai, he continues to collaborate on publications, exhibitions and installations locally and abroad. An architect, teacher and photographer based in Surat, after finishing his bachelors in Architecture from S.C.E.T, Surat and Master’s from Washington University St. Louis, he went on to work with notable organizations like Studio Mumbai Architects. At present, he is an independent consultant. Mitul strongly believes in contributing to the academic society that he is a part of. He has taken up the roles of visiting faculty for institutions under the South Gujarat University, guest critic for Accademia di Architettura di Mendrisio for Bijoy Jain studio, and studio coordinator for BASE Mumbai. Apart from this and his independent practice, he is constantly and thoroughly observing, and documenting the ever-changing Indian landscape. Ramesh Annapindi is a ‘Designer Strategist’ dedicated to genuinely understanding people, using design as a tool to make their lives better. Ramesh is the founder of MADLAB — a design and innovation studio embedded inside Bangalore’s startup and e-commerce hub. At its core, MADLAB believes in developing products and services that people love to use. More broadly, MADLAB likes to solve India centric challenges with an eye towards future applications and implications. Prior to establishing MADLAB, Ramesh has spent over 12 years in US helping companies like Disney, Kohler, HP, Clorox, Scorelogix and Cepheid enjoy the rewards of Design-led Innovation and communication culture. Ramesh is an experienced leader with working experience predominantly in Design Strategy, Consumer Centric Design, Product Innovation, Brand Build, Content Design and Design Communication. Aside from his duties as a strategist, Ramesh believes in giving it back to the community and has been conducting innovation and design workshops. He has taught design-led innovation at Center for Creative Studies(CCA), Art Center College of Design (ACCD), Center for environmental planning and technology (CEPT) and National Institute of Design (NID). This engagement helps Ramesh hone in on his mentoring and management skills. Rohan Nanavati is a communication designer with over a decade of experience in crafting brand identities for large companies as well as start-ups. He is a believer of honesty and authenticity in branding, and regards consumers as the sincerest investors of any brand. After being awarded an MA in Graphic Design from SCAD-Atlanta in 2008, Rohan worked in the United States for a year; after which he decided to move back to his hometown Surat to begin his own practice in the field of communication design—something that the city was lacking at the time. Rohan's expedition in education has been driven by his love for design, and the wish to help students express themselves visually in an articulated manner. He has been a visiting faculty, guest juror, and guest interviewer at VNSGU. Apart from this, he also co-founded a non-profit that organizes design talks, student portfolio reviews by professional designers, and workshops for design students. At Auro Design School, Rohan's mission is to inspire students the way he was inspired by the global design educators that taught him — ensuring that students not only learn but are also armed with a great portfolio that can open doors for them. He teaches studios related to communication, brand identity, typography, publication design, package design, and interaction design. Rooshad Shroff received his undergraduate degree in Architecture at Cornell University where he was awarded the Edward Palmer York Memorial Prize for Outstanding performance in Design, as well as the Michael Rapuano Memorial Distinction in Design Award. Whilst pursuing his Masters in Architecture at the Graduate School of Design at Harvard University, Rooshad served as a Teaching Assistant to renowned Spanish architect InakiAbalos. In 2011, he founded Rooshad Shroff Architecture + Design (RS A+D), which is a multi-disciplinary design and research studio. Founded predominantly as an architectural practice dedicated to the realization of spaces, it soon developed its own design department that crafts bespoke furniture, products, and materials. Using traditional Indian techniques and making it a point of honour to re-actualize the handmade, it became a reference within the design world for highly sophisticated design pieces. Prior to founding RSAD, Rooshad Shroff worked at the offices of internationally acclaimed architects such as Zaha Hadid in London and OMA/REX in NYC. His work has garnered much attention with his graduating thesis exhibited as part of the Emerging Talents, Emerging Technologies Exhibit at the Beijing Architecture Biennial in 2006.His work produced at the GSD has also been exhibited at the 2010 Venice Architecture Biennial as well as the 2010 Shanghai Expo within the Spanish Pavilion. Samir Parker is a designer, artist and teacher working with space and identity across scales and cities. An alumnus of the School of Interior Design, CEPT University, Samir's practice as an artist has been supported by fellowships and residencies at various organizations like the Khoj Studios in New Delhi, the Rockefeller Foundation Bellagio Center in Italy and Quebec Government in Canada. He has had his work exhibited and published by UNICEF, the London School of Economics, the Venice and Shanghai Biennales, the Fonderie Darling in Montreal and the Chatterjee and Lal Gallery in Mumbai among others. Samir's urban art project roof/tarp/city and his collaborations with Dismaland artist Jeff Gillette have received international recognition and support. He has worked with the Namma Metro, and the Srishti Institute of Art, Design and Technology on the pilot project - Art in Transit at Peenya Station in Bengaluru. As an educator, in recent years he has been setting up the Srishti campus in Pune and developing the Lower Parel Innovation District project in Mumbai with ISDI-Parsons. Vaishnavi is an independent designer working on creating brand identities, communications, and packaging design for various companies. An alumnus of the School of Interior Design, CEPT University, she also holds a MS in Communications Design from Pratt Institute, New York. While at Pratt, she was awarded the Pratt CC Inform Fellowship and had her Gallery Installation. After graduation, she worked for a year with Li & Fung on retail communication design for various international fashion brands such as Vera Wang & French Connection. Returning to India and setting up base at Surat, she went on to ideate and execute the design for the flagship Lifestyle Centre venture VR Surat, bridging various disciplines (interiors, landscape design, Graphics and FF&E). Her Bachelor’s degree in interiors combined with a Master’s in graphics, helps her understand the nuances and complexities of these varying scales and visualize them holistically. She has been a visiting faculty at SCET & VNSGU Surat, where she teaches Basic Design, Interior Design & Graphic Design. Vicky Achnani is an architect by profession with Bachelor's from Cept University. He won the Erasmus India4Eu II scholarship and pursued an exchange master’s program at ETSAM, Madrid. He also had his work published at the Venice Biennale 2014 for Spanish Pavilion during his internship at ETSAM under Ar. Inaki Abalos. Now, he is associated with Cept University as an Academic Associate, and conducts material design studios, and construction courses. His area of interest lies in ‘Making’ and looks at architecture and design as a composition; comprised of a set of details and parts coming together. Apart from teaching he runs an architectural practice in Surat where scaled models become tools and catalysts that explore design possibilities, resolutions, and narration. Currently his studio focuses on research on material systems for building and deployable structures. Vishal is an Architect who earned his degree from the School of Interior Design, CEPT. He is the owner of Idea Factor, a studio that occupies itself with the concept ‘lightweight’ and specializes in the design and engineering of tensile structures, planning and execution of large scale ephemeral structures, assembly and disassembly of interior elements, and product scale objects. Before founding Idea Factor, he was a senior designer at Kakani Associates. Understanding the importance of giving back to the educational community, he was a visiting faculty for NID and IPSA Rajkot, and project Associate at IIT. Even after Idea Factor, he still finds time for academic institutions as evidenced by his long-standing commitment as a visiting faculty for the School of Interior Design at CEPT.